William V. Rauscher presents an array of past and present unusual personalities in the field of psychic entertainment and private readings. Like a vaudelville show, the performers appear in a series of acts that confuse, confound and perplex their followers, and create ethical issues for laymen, researchers and magicians. This book is a potpourri of remarkable characters whose talents, skills, performance styles, personalities and approaches vary greatly. 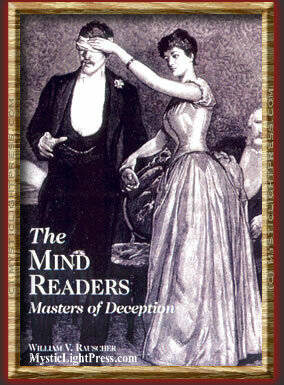 For want of a better term, they are The Mind Readers, and they are Masters of Deception. William V. Rauscher takes the reader through a labyrinth of colorful, perplexing and enigmatic people who are committed to making you believe! Hard Bound Silver Stamped, Dust Jacket, Over 171 pages, Over 200 Photos and Illustrations. Contact 1878press@gmail.com for ordering information. "It is truly a "who's who" of psychic entertainment over the century...A skilled writer, even in these small sketches Rauscher is able to give us a flavor of their varied talents, skills, personalities and idiosyncrasies. Many of them are characters in the modern sense of the word - very different from the norm, and strange...What is clear is Rauscher's disdain for those mentalists and psychic entertainers who give private readings for money. He considers it blasphemy. Indeed, it is an ethical question of some magnitude, for instructional materials for conducting private readings are readily available to the magic fraternity. I found the book entertaining reading, and frequently wished that it were three times its length so that we might delve more into the interesting personalities presented." "Whether or not you agree with Rauscher's critical comments on the ethics of private readings (I generally agree with him, for he is not an extremist), you will find a great deal of material here including many photos available nowhere else. I think anyone serious about mentalism should rush out and get a copy of this book if only because it has a limited printing and will become quite collectable. The book is a treasure trove...if you are interested in the history of mentalism, I strongly urge you consider getting this book." "Your book is wonderful. It addresses a field in magic that hasn't been covered very much. And it brought back so many memories of performers we have either seen or known personally." "I am thoroughly enjoying the book! Fascinating and so interesting to read. Very entertaining and informative." "Just had a letter from Corinda (the renowned mentalist and author of the classic '13 Steps To Mentalism') in it he congratulates you on the book and its contents..a great read and he is appreciative of the effort involved. " "What a cast of amazing characters you assembled! A splendid production it is! People like you make your knowledge available to those who will come after - while also entertaining us here and now." "Your book is amazing! We purchased a copy and after reading it described it to a few friends. This created such an interest that we decided to by 1/2 dozen!" "I've just finished reading your latest work "Mindreaders" and I must say, I enjoyed it immensely. Most of my part-time performing career was as a mentalist and I was almost sure, based on information form some friends in the business, that I wouldn't like it...I WAS WRONG." "A revealing picture of a magic subculture where odd characters abound. these individuals exemplify trickster theory and the nexus of magic and the paranormal." "This unusual book contains twelve chapters discussing 135 mentalists from David P. Abbott to Zenola... I found it fascinating and think you will too." "A wonderful overview of some truly great characters. As I was joyously working my way through it, I wanted a whole book by you on each person profiled. It's just great. It left me wanting more." Todd Robbins - famous Sideshow performer, expert and authority on deception and fraud. Creator and star of the off-Broadway hit Carnival Knowledge and Dark Deceptions with appearances on more than 100 TV shows.